Communications companies are under intense pressure to keep operating costs such as customer service low, while growing customer share, improving customer retention and increasing revenues with new service expansions. To meet these challenges, telecom companies are increasing their investments in CRM strategies and software. A study from telecom market research and consulting firm Dittberner Associates forecasts resurgent growth in the market for CRM and related customer service software solutions. The research report titled, Telecom Customer Assurance & Analytics, estimates the telecom industry software market at $997 million in 2005 and projects growth to $1.3 billion in 2010. The Dittberner report cites the complexity of product pricing, promoting, and personalizing next generation telecom services as the main impetus for telcos to pay greater attention to CRM processes and automation software. "If we've learned anything from the telecom industry's last recession, it's that investing in the latest network innovations is no guarantee of business success", says Dan Baker, director of Dittberner's OSS/BSS KnowledgeBase. "That's why, in today's competitive world, investments in customer-keeping and customer-monetizing technology are as vital as a telcos' investments in network infrastructure." The telecom industry has experienced greater fluctuation with regard to customer relations that possibly any other. When telecom was a monopoly industry, customer care was far from a critical success factor. Monopoly (or oligopoly) telecom companies cared more about their delivery networks than achieving a positive customer experience with captive customers. However, in 1984 when AT&T was declared an illegal monopoly by the US government and split apart, the industry was forced to change. 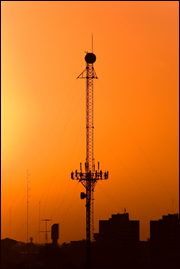 The wireless industry was born, new technologies such as CTI (computer telephony integration), IVR (interactive voice response) and real-time bill inquiry appeared, and customer care made a comeback as a requisite process to survive and thrive. While the telecom industry experienced a decline with the dot com bubble at the turn of the century, since the 2003 U.S. economic upswing, communication service providers (CSPs) have again increased their CRM software investments in order to grow customer wallet share and converge services such as triple and quadruple play. CRM software systems help telecom operators manage and control the single most concern that faces them in the light of increased competition - customer turnover. Customer analytics has become a boom for telcos and is now a standard part of CRM applications such as Customer Service Management, Call Center Support and Sales Force Automation (SFA). CRM solutions for the telecom industry equip telcos with competitive advantage by providing the tools to identify and retain profitable customers. In a Telecom environment, CRM software plays additional, specialized roles beyond the traditional account, contact and activity management. Telecom CRM systems help manage customer churn by analyzing data collected from other touch-points across functional areas like sales and service. When integrated with transactional data like usage and call patterns, analysis reveals rich insights and intelligence into customer behavior and helps identify and mitigate customer churn. An increased number of competitors, higher consumer expectations, fast and frequent consumer switching from one supplier to another and a high dependence on economic conditions have converged to result in an increasingly challenging telecom market. Unlike most other industries, CRM systems in the communications industry battle with established billing vendors for market share. CRM software criteria particularly useful in the communications and media industry include flexible up-sell and cross-sell support, sophisticated multiple party relationship controls, support for sale opportunities over multiple periods (often based on a subscription type agreement), close CRM integration with the sale order fulfillment process, integration with Web 2.0 and social media tools and built-in or integration with content management systems. CRM systems should further empower CSPs to migrate from costly sales and service channels such as call centers to more cost-effective channels such as self service, email, and interactive voice response (IVR) systems. Amdocs and Siebel hold the top market share leadership position. SAP, Aspect and Oracle are the second tier challengers. Avaya, Witness Systems, Genesys Telecommunications, Onyx and Unica round up the third tier. The next update to this industry page will reaffirm top telecommunications CRM software leaders and include updated Telecom Industry CRM software market statistics. CRM strategists, practitioners, consultants and users in the telecom industry may want to check out the "Annual Strategic CRM in Telecoms" conference. The conference normally includes well done case studies by several leading telecom companies that have implemented, measured and refined business process and software technology frameworks which combine to deliver consistently outstanding Customer Experience Management. Visit the Jacob Fleming Group conference site for more conference information. The telecom industry faces a divergence whereby financial pressures are extremely high while at the same time customer loyalty is very low. Telecommunications companies also find themselves in a competitive struggle to efficiently and affordably meet the demands of millions of customers with increased expectations for timely customer service, 24 by 7 customer interaction, always-on self service capabilities and a supplier experience that is simple, effortless and always accurate. The below CRM software vendors offer vertical market software systems for the telecommunications industry.